PETALING JAYA: Analysts expect property loans to maintain their position as a key growth driver of credit expansion with some estimating them to grow between 10% and 12% this year due to the low interest rate environment and ample liquidity in the banking system. While holding to this view, some feel the external environment, like the slowing US economy coupled with the sovereign debt crisis in the eurozone, could dampen demand for properties. For the first seven months of this year, property loans remained the key growth driver, accounting for 40.6% of the banking system's overall credit expansion, followed by working capital loans at 23.6%. Residential property loans currently accounted for about 27% of the system's total loans. We believe that the full year loan growth for residential property loans will be in the 10%-12% range.- RAM Ratings head of Financial Institution Ratings Promod Dass. RAM Ratings head of financial institution ratings Promod Dass told StarBiz that the credit environment to date had continued to be accommodative for borrowers with ample liquidity in the banking system and a stable economic environment. Coupled with attractive promotional packages offered by some developers, he said residential property loans had already shown a healthy 7.1% growth in the seven months to July (or 12.1% annualised), which was more or less at a similar pace compared with the overall total banking system's year to date loan growth of 7.5%. “We believe that the full year loan growth for residential property loans will be in the 10%-12% range although we are closely observing the sovereign problems still brewing in Europe as well as concerns on the US economy and the consequent impact on Malaysia's economic growth stamina, which could affect consumer sentiment in property purchases,” he reckoned. 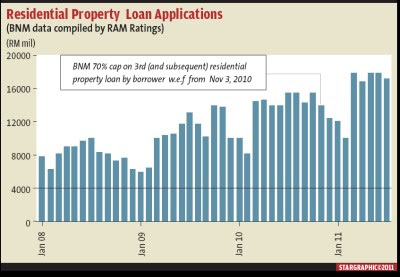 Dass said that while there was a slowdown in loan applications for residential mortgages in the few months after the implementation of the 70% loan-to-value cap on the third and subsequent house financing, the momentum had picked up again since March. The move to curb the third and subsequent home financing was introduced by Bank Negara on Nov 2 last year to quell speculation on residential properties. Alliance Bank Malaysia Bhd consumer banking head Ronnie Lim said he was bullish on property loans. He noted that in Malaysia, housing loans currently accounted for 50% (or RM255bil) of total household debt (RM510bil) and would continue to be one of the key growth drivers of retail credit expansion this year and in the near future. “One of the main growth areas for properties is Klang Valley, which accounts for close to 60% to 65% of all property transactions. In addition, the population growth in Klang Valley is expected to reach 10 million by 2020 and the demand for residential property is expected to be fuelled by residents of Klang Valley whose average age is 34 years old. “Coupled with the shortage of land in Klang Valley, demand will always out-strip supply. The economic growth and the low unemployment rate in the country is another catalyst for housing loan growth. The recent Economic Transformation Programme (ETP) announcement will further accelerate demand for residential properties as more affordable properties are being developed,'' he said. Lim said prices of properties in Malaysia were still one of the lowest in the region when compared with countries like Thailand, Hong Kong and Singapore. The industry's total housing loan outstanding stood at RM255bil as of July 2011 compared with RM234bil in December 2010, he noted, adding that this represented a 14% annualised growth. Given the positive environment and the above factors, Lim said the bank was confident the current growth rate could be maintained despite the recent global market unrest. An MIDF Research banking analyst said property loans would hold up as a key growth driver of credit expansion this year as the persistent demand for property loans would be driven by low lending rates as well as the sustainable growth of the property market.